A centerpiece of the Governor's strategy to jumpstart the economy and create jobs, the Regional Councils were established in 2011 to replace the state's old top-down approach to economic development, with one that is community-based and performance-driven. The initiative empowers community, business, and academic leaders, as well as members of the public in each region of the state, to develop strategic plans specifically tailored to their region's unique strengths and resources in order to create jobs, improve quality of life and grow the economy. More information on the 2017 Regional Economic Development Council Awards is available here. "Over the past seven years, the Regional Economic Development Councils have successfully brought together the most innovative minds in economic development, fostering collaboration between state and local leaders to invest in New York's regional resources from the ground up," Governor Cuomo said. "These awards are critical to building the foundations for New York's future and ensuring that our economic momentum continues. I congratulate each of the Councils on their awards and look forward to continuing to partner to keep our communities vibrant and thriving for years to come." 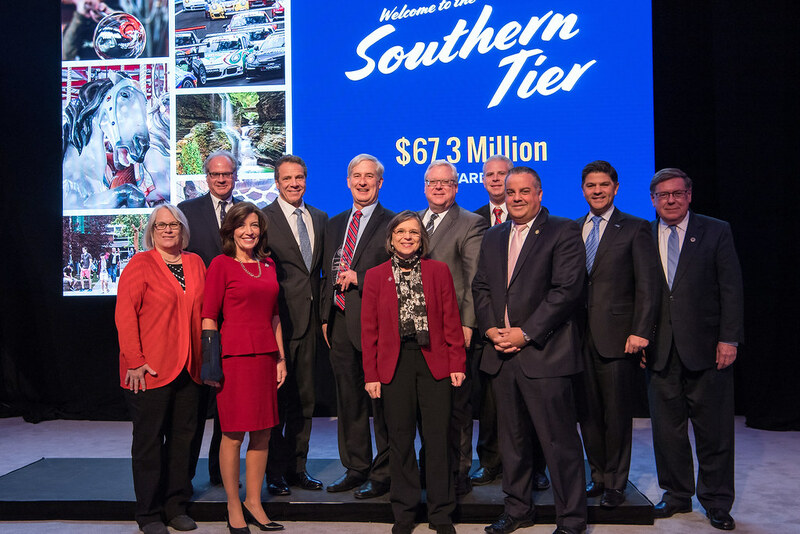 "By empowering the people who know their communities best, the Governor has transformed this state's economic development strategy into one that is not only successful, but is built to last," said Lieutenant Governor Kathy Hochul, Chair of the Regional Economic Development Councils. "Together, we're restoring downtowns, supporting local businesses and welcoming new residents and new visitors. That's the story of the REDC's that everyone needs to know. Thanks to the leadership of Governor Cuomo and the exceptional plans presented by the REDC's across the state, we are ensuring that progress continues." The REDC process has transformed New York State government's approach to economic development, creating a statewide framework for bottom-up, regional economic growth and streamlining the state funding application process. Since the initiative's inception in 2011, over $5.4 billion has been awarded to more than 6,300 projects that are projected to create and retain more than 220,000 jobs statewide. In the spring, Governor Cuomo kicked off REDC Round VII and the second year of the Downtown Revitalization Initiative. The $100 million Downtown Revitalization Initiative (DRI) is a comprehensive, community-driven effort to improve the urban vitality of city centers across New York State by investing $10 million in 10 municipalities statewide. Earlier this year, after thoroughly evaluating each downtown's potential for transformation, each of the REDCs selected the top community plan in their region. To guide the use of the $10 million DRI awards, each municipality follows a Strategic Investment Plan, which identifies specific projects that align with a unique vision for revitalization of their downtown area. A full list of communities in which $10 million will be invested through the DRI, along with their applications, is available here. In 2017, all 10 REDCs competed for designation as a "Top Performer." The five Top Performers will receive up to $20 million in additional Empire State Development grant funding to support priority projects, with the remaining five regions receiving up to $10 million. Additionally, each region is eligible for up to an additional $75 million in Excelsior Jobs Program tax credits to help attract and grow businesses in the region. "These awards are critical to building the foundations for New York's future and ensuring that our economic momentum continues." The University at Buffalo has been awarded $1 million from Empire State Development to support a $7.4 million expansion of High Performance Computing (HPC) infrastructure. The expansion will provide Western New York companies from myriad industry sectors with access to advanced computing equipment that will foster innovation, reduce time to market and improve processes, with an emphasis on emerging technologies for data analytics. Alfred University has been awarded $1 million from Empire State Development to support the renovation of the Southern Tier Business Center, remediating a blighted structure and returning it to productive use. The $7 million Center will encourage entrepreneurship, help businesses develop innovative, cross-disciplinary solutions, and assist them with implementation of solutions, particularly those involving commercialization of products that rely on advanced materials' processing and characterization. The City of Niagara Falls has been awarded $1.5 million from Empire State Development for the Southend Gateway District Revitalization, which will lead revitalization efforts that leverage private investment in the South End Downtown neighborhood, a gateway to the city's tourism district, through restoration and renovation of existing structures and new construction of commercial and mixed-use properties. OptiPro has been awarded $600,000 from Empire State Development to support a $9.25 million expansion and purchase of machinery and equipment to grow its domestic and export sales of precision optics products. The Center for Teen Empowerment has been awarded $400,000 from Empire State Development for a $2.9 million expansion project in the City of Rochester's Southwest Quadrant and the opening of additional locations in the Northwest and Northeast Quadrants. The expansion will allow the organization to increase their capacity to service youth and young adults for their job training and placement programs in the areas of the City most impacted by severe poverty. The Rochester Museum Science Center has been awarded $1 million from Market New York to undertake Phase 2 of a renovation project, replacing the current disintegrating driveway between the Museum and Strasenburgh Planetarium with an amazing 4,000 square foot Gateway Building. This progressively designed, environmentally sensitive building featuring energy-efficient floor to ceiling glass walls, an open lobby and new welcome desk will offer visitors enhanced amenities and improve operational efficiency. Beecher Emission Solution Technologies (BEST) has been awarded $800,000 from Empire State Development to acquire the former Schweizer Aircraft Corporation manufacturing facility in the Town of Big Flats, Chemung County, to allow for business expansion and centralizing all manufacturing operations and employees. Golden Age Cheese Company has been awarded $2.1 million from Empire State Development to construct a new $10.7 million state-of-the-art cheese production and development facility in the Village of Painted Post. By increasing their need for local milk and adding jobs in cheese production, the project will help to fill a void in the market being created by the recent transfer of the Kraft facility in Campbell to Upstate Niagara. Schuyler County has been awarded $1.3 million from the Department of State's Local Waterfront Revitalization Program to implement projects to enhance the Seneca Lake waterfront in the Village of Watkins Glen. Projects will include design and construction of a four-season pavilion including restrooms and a commercial grade kitchen in Clute Park and preparation of a Reuse Feasibility Study to explore options for redevelopment of the soon to be decommissioned lakefront Waste Water Treatment Plant. Marquardt Switches Inc., a manufacturer of electro-mechanical switches and control systems with North American Headquarters in Cazenovia, Madison County, has been awarded $600,000 from Empire State Development to complete the $3.1 million Phase II of its Global Technology Center (GTC), including expanding the workspace for engineering and professional services, investing in high-tech manufacturing and testing equipment as required to satisfy consumer demand for the most advanced products available on the market, and upgrading employee technical skills. The project will build the company's technical capabilities as an innovation center, allowing it to remain competitive in the internal and global market places. Fulton Group NA, Inc. and Affiliates has been awarded $2.5 million from Empire State Development to support an $11.25 million project, including the purchase of a facility in East Syracuse; renovations to facilities in Pulaski, East Syracuse, and Syracuse; purchase and installation of machinery and equipment; and research and development activities to develop new products offerings. Martens Companies, LLC has been awarded $1.18 million from Empire State Development to create a $4.7 million commercial food processing, packaging and distribution center in Cayuga County, focusing primarily on health-conscious foods. The project includes land acquisition and constructing and equipping a new 150,000 square-foot facility. The Mohawk Valley Resource Center for Refugees has been awarded $248,000 through Empire State Development to establish the One World Utica Welcome & Opportunity Center, which will help to foster and enhance the welcoming community climate in the Mohawk Valley and City of Utica. The Center will support community engagement, create opportunities for workforce development, and ultimately cultivate a sense of community and inclusiveness for all newcomers and residents. The Neighborhood Center has been awarded $1.75 million from Empire State Development to create the Soularium Addiction Treatment Center - a rehabilitation and healing facility for the treatment of addictions. The Center's mission will be to assist individuals in beginning their journey to wellness and recovery by utilizing evidence-based holistic, clinical and behavioral health recovery/discovery treatments. Brewery Ommegang has been awarded a $525,000 Market NY grant for the Ommegang Hospitality Center, upgrading the experience at Brewery Ommegang in order to draw more visitors, from a broader area, and to enable them to better serve those visitors throughout the year. General Composites, a company producing high tech molding equipment for the aerospace and defense industries, has been awarded $93,000 from Empire State Development to support the purchase and installation of $465,000 in injection molding equipment. Bionique has been awarded $300,000 from Empire State Development to support its Testing Laboratories' lab equipment upgrade and purchase project. The $1.5 million project will provide the most updated technology for the lab's mycoplasma testing procedures. Current Applications has been awarded $23,000 from Empire State Development for a balancing equipment purchase to be used in their custom motor manufacturing facility. The $118,530 project will bring back operations currently outsourced to China. The Starbuck Island Development Project has been awarded $1.79 million from Empire State Development to support an $8.9 million project that will enable the revitalization of blighted area, restoration and development of a sustainable waterfront, and creation of a walkable community connecting Green Island residents with economic and recreational opportunities. The project will also improve safety by remediating and redeveloping a vacant and contaminated area, while creating a main street feel with housing, restaurants, a marina, and a promenade and amphitheater in a location easily accessible to a larger commercial location. The proposed commercial uses will create jobs for those in the region, create new location desirable for housing, and allow patrons and residents to walk to their destinations. Hudson Valley Community College has been awarded $2.9 million from Empire State Development to create an Advanced Manufacturing Training Program, with a total project cost of $14.5 million. The project will include the construction a 30,000 square-foot building with laboratory space as well as classroom space and an academic advisement center. Additionally, manufacturers will have lab and office space available for their use, which will link students to career opportunities upon graduation. This project is anticipated to double the number of students enrolled in the Advanced Manufacturing Technology program from 144 to 288. Z-Hub has been awarded $300,000 from Empire State Development to create a $1.5 million Grain Hub in the Town of Moreau, Saratoga County. The Grain Hub will create a reliable source for high quality craft beer brewing ingredients by growing, harvesting, processing, packaging and shipping grains to craft brewers and distillers in eastern New York State. JM Development Group LLC, in partnership with Kingston-based Herzog Supply Co., has been awarded $2 million from Empire State Development for the The Kingstonian Uptown Revitalization Project, a mixed-use development project in the up-and-coming urban center of Uptown Kingston. The approximately $48 million mixed-use development project will serve as a cornerstone to the city's historic Stockade District, complementing other area businesses and providing valuable parking spaces desperately needed in this fast-growing section of the city. USAI, which creates custom LED products balancing color and optics to maximize circadian rhythms for performance, health, and well-being, has been awarded $1.02 million from Empire State Development to support a $3.8 million project that will attract clients from around the world to train and develop products specific to their needs. Clients will also experience the benefits of working in a curated lighting environment through the creation of a working laboratory, new engineering lab and expanding office space. The Walkway Over the Hudson's East Entrance Visitor Center Project, which will be called the Dutchess Welcome Center, has been awarded $500,000 from the Office of Parks and Historic Preservation to build a much-needed, $3.1 million multi-purpose facility at the busy entryway to this world-renowned New York State park. Located in the City of Poughkeepsie, the Welcome Center will feature permanent rest rooms with running water and sewage connections, a covered gathering area able to accommodate up to 40 visitors, water fountains, vendor pads with electric access, benches, lighting, landscaping and other amenities suitable to accommodate the over 500,000 visitors Walkway Over the Hudson State Historic Park hosts annually. B. New York City (B.NYC) has been awarded $1.9 million from Empire State Development. B.NYC will be the flagship U.S. location of B. Amsterdam, which is the largest startup tech incubator in Europe. B.NYC will provide flexible workspace and business development assistance to the growing number of foreign tech companies that are moving to or opening operations in the U.S. The grant will support the $28 million renovation of an empty space that will accommodate the incubator, which is expected to be completed in 2018. Celmatix, a biotech company working on products to improve fertility and women's health, has been awarded $4.5 million from Empire State Development to expand its collaborative workspaces, offices and conference rooms, and add over 3,000 square-feet of laboratory space. The $12.5 million project is expected to begin in early 2018. Drive Change has been awarded $700,000 from Empire State Development to establish the Commissary for Social Justice, a program that includes skills training, permanent job placement and support services. Drive Change will build a facility where food truck owners can prep food, store goods, clean and park their trucks, and purchase items wholesale. In exchange for these services, participating food truck owners will agree to hire and teach clients of Drive Change. The $3.5 million facility will also include an urban farm. The Center for Science Teaching and Learning has been awarded $540,000 from Empire State Development to create Community STEM Centers in nine distressed communities such as Hempstead, Wyandanch and Central Islip. These centers will have equipment like 3D printers, robotics equipment and trained staff to teach, mentor and show how STEM can be the pathway for many young people to higher education and successful professional careers. Stony Brook University has been awarded $2 million from Empire State Development to the support their Center for Wide Bandgap Crystal Growth. This $5.5 million project provides a new area in discovering new applications in the silicon wafer and power electronics industry. Stony Brook University will collaborate with SICC Materials Limited, a leading Chinese silicon carbide manufacturer, to establish this center. Nassau Community College has been awarded $100,000 from the Department of Labor's Unemployed Working Training fund for its URGENT Workforce Development Program. URGENT (Utility Readiness for Gaining Employment) will use the funding to offer its training program to unemployed women, veterans and young people between the ages of 18 to 24. The first Veterans group training is slated for Fall 2018. Long Island REDC has delivered $570.8 million for 688 projects. The Regional Economic Development Council (REDC) initiative is a key component of Governor Cuomo's approach to State investment and economic development. In 2011, Governor Cuomo established 10 Regional Councils to develop long-term strategic plans for economic growth for their regions. The Councils are public-private partnerships made up of local experts and stakeholders from business, academia, local government, and non-governmental organizations. The Regional Councils have redefined the way New York invests in jobs and economic growth by putting in place a community-based, bottom up approach and establishing a competitive process for State resources. After seven rounds of the REDC process, more than $5.4 billion has been awarded to more than 6,300 job creation and community development projects consistent with each regions strategic plans, projecting to create and retain more than 220,000 jobs. For more information on the Regional Councils, visit www.regionalcouncils.ny.gov.